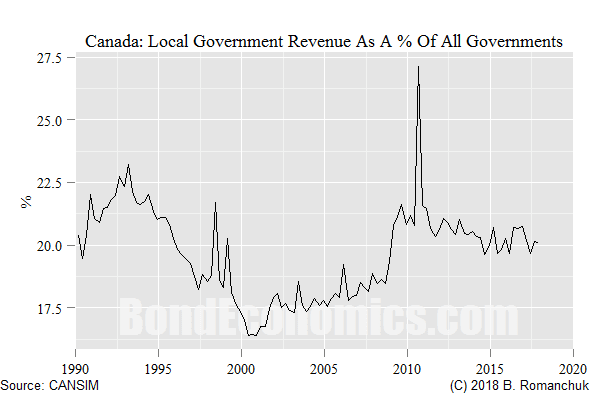 The funding of Canadian municipal governments is not normally thought of as interesting topic; even Canadian fixed income investors are not particularly excited about it. However, there are two side issues that are of general interest. The first question is: what happens to Canadian municipalities if the housing bubble pops? (As a spoiler, not very much.) The second question is the feasibility of a Land Value Tax (LVT) which is a concept that gets some people on the internet very excited. I will then outline why a LVT is inferior to the Canadian property tax system (which is not that different than the American system for that discussion). The big difference for government finance between Canada and the United States is that Canadian provincial governments have much bigger economic footprints than American states. Canada has a larger welfare state, and it is largely implemented at the provincial level. Furthermore, Canadian provinces do not have balanced budget laws (which would make implementing the welfare state at the provincial level impossible). Modern Monetary Theorists would argue that the welfare should be implemented at the Federal level, but the Canadian Constitution trumps economic common sense. When we drop to the municipal level, I believe that Canadian municipalities have less independence than is the case for American municipalities. For example, the Quebec government unilaterally decided to merge municipalities as a move towards cleaning up administration in the early 2000s. (The citizens revolted, and a number of those mergers were unwound.) I believe that most American states lack the authority to do anything similarly obnoxious. Details obviously vary across the country, but as in the United States, property taxes are a major source of municipal revenue. (Taxes for schools and utilities like water or garbage collection would be at this level. I think that school tax rates are linked to property tax rates, but might not be included in the property tax numbers in the chart I show below.) To distinguish a property tax from a Land Value Tax, a property tax is levied on the value of both the land, as well as the buildings on the land. Property taxes are based on an assessed value. In my municipality, there is a periodic reassessment of property values (every few years) based on market pricing, plus you will get your assessment bumped up if you foolishly do major renovations (which I am about to do...). Since all property transactions are registered by the municipality, they have a very good idea what prices properties are transacted at. My feeling is that the assessed property values are pretty good estimates, but with a tendency to be slightly low (across the board). Having the assessed values being somewhat below the true market price is a useful way to keep the number of challenges to assessments limited. The only way the market value of your property is far below the assessed value is that you have some serious hidden defects. However, most homeowners know enough to not run to the entity that has the power to condemn properties as unfit for human habitation to argue that their assessment needs to be lowered because of mould on their house's framework. Canadian municipal finance rules are straightforward. The municipality just follows the given algorithm. Determine the sum of all assessed property values in the city. Figure out how much property tax the city wants to raise. Divide (2) by (1) to get the tax rate. The city will need to take into account property tax rates in nearby municipalities, but that is about it. The flexibility of the tax rate means that changes in house prices alone have no effect on property tax revenue. (There are other channels, noted below.) If assessed house prices rise by 10%, they just cut the tax rate by 10%. This means that homeowners just need to look at the tax bill (and scream); the assessed property value is there for entertainment purposes only. This means that Canadian municipalities are not going to be crushed by falling house prices by themselves (which is different than what was seen in some American municipalities). There would be some forced austerity at the local level, but it would be small potatoes. A housing development boom does help municipal finances, via new developments raising property values, as well as the Orwellian "Welcome Tax" (a tax paid when buying a house). Those positive factors would reverse, but it would not force widespread retrenchment. In a deep recession, the worry would be about the provinces, and whether they are "too big to fail." Is the Property Tax a Good Tax? Before I get to the Land Value Tax, I want to first discuss the desirability of its close cousin: the property tax. My discussion here is extremely Canada-centric -- although I would argue that the situation is not that different in the United States. For other countries, there are differing institutions and political constraints. In interests of space, I am not going to discuss all issues with the tax, rather a more practical question: is it possible to greatly increase the property tax? The macroeconomic problem is that property taxes have no counter-cyclical properties. They tend to be flat across the cycle, and so they will not help counter-act recessions, nor are they particularly good for inflation control. Municipal governments are too small to apply Functional Finance principles to, but we need to worry about Functional Finance for aggregate behaviour. Finally, the key problem is that property taxes are levied with no strong link with the capacity to pay. If you want to get theoretical about it, you are levying a tax on a stock, while incomes (and taxes) are flows. Believers in 19th century economic theory might believe that "economic rents" are constant over time, whereas casual knowledge of capital market behaviour tells us that it has to vary with time (assuming it exists..). The basic law of taxation is that you can't get blood from a stone. No matter what your personal political animus against the stone is, it just ain't happening. Property taxes fight against that principle. 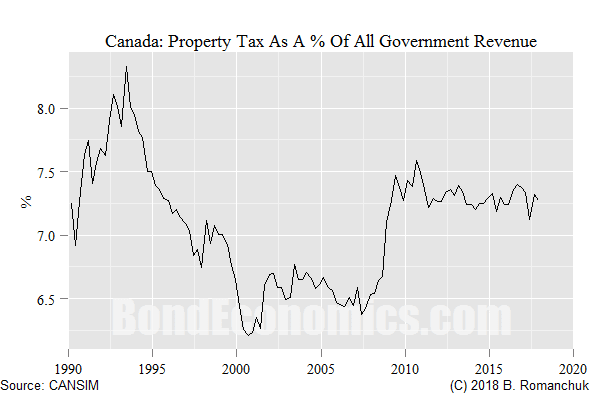 The chart above shows percentage of "real property taxes" in total revenue for the General Government sector (which includes contributions to the Canada Pension Plan, which are indeed taxes). (As a disclaimer, this data set from Statistics Canada is new, and I am unsure about the details. It may be that some of the local government taxes are levied based on property values, and might be lumped in with property taxes.) As can be seen, it is a small number. In order to help personalise the issue, I will discuss some back-of-the-envelope numbers for my local municipality. If you have a single earner household that has not bought an insanely large house, the property taxes would drop to about 10% of all taxes paid at an income level somewhere below $100,000. For those of you not familiar with our funny-money currency, $100,000 is a solid upper middle class salary -- more than a junior financial analyst, but probably less than what a competent plumber is making right now. (Since homeowners are often married, the ratio more generally would depend on how income is distributed.) Since all-in marginal income tax rates in the People's Republic of Quebec is around 50%, the importance of property taxes rapidly collapses as incomes rise above $100,000. However, this no longer the case for seniors. The Canadian system has dealt with the problem of senior poverty by letting them putter around in their houses. This is achieved by giving them a minimal Canada Pension Plan (Quebec Pension Plan) and Old Age Supplement (plus need-based transfers). They can survive on low pre-tax incomes since they pay little taxes (mainly the value-added tax). Raising property taxes is a direct assault on their limited fixed incomes. In other words, raising property taxes will be a mosquito bite for the rich, and you will end up liquidating the class of senior citizens. "Why do you hate old people?" is the correct response to anyone advocating a massive increase in property taxes. Anyone with knowledge of Canadian seniors is that they are ornery, and taking them on politically is suicidal. I lived in England, and I grasp the historical tribal class divide between land-owners and renters in European politics. From what I have observed in England, it seemed to me that this distinction was breaking down. In Canada (and the United States), that binary division does not fit the political facts on the ground. From 2006 to 2011, home ownership rates increased from 27% to 35% among 20- to 29-year-old households, and from 67% to 71% among households aged 70 or older. Furthermore, rural incomes tend to be lower than urban. However, land is cheap, and there are almost no building code enforcement. Anyone who has been working for most of their life should be able to afford a shack somewhere in rural Canada. Class warriors might think that renters will be spared. It is likely that in the short term, property taxes will not be passed through into rents. However, it is only possible to squeeze landlord profit margins, but there will always be profits. There will be no rental supply forthcoming at a loss. Large increases in property taxes raise the cost of doing business for landlords, and they will be passed through to renters. This is what happens when you impose taxes that are not linked to the capacity to pay. You have to go where the money is, and only income flows point us to that location. This is why modern welfare states are powered by income and value-added taxes. If you live in a jurisdiction without a competently-run property tax system, a Land Value Tax might be a good idea. It may also be easily implemented in ridiculous postage stamp countries like Singapore, or on targeted districts like Manhattan. My comments here refer to the merits versus a property tax, and for countries like Canada that are large enough so that swinging a cat around by its tail does not involve having its nose pass through several border controls. Taxing land alone would be a straightforward change to the property tax system: we zero out the value associated with the building on the assessment, adjust tax rates accordingly, and send out the new property tax bills. However, no municipality in Canada is crazy enough to do that. Why? The first problem is that it would be a steeply regressive change to the distribution of tax. In urban areas, plot sizes are relatively uniform within a district, while building values are not. Taxing land alone redistributes taxes from young people living in McMansions to old people who live in bungalows. "Why do you hate old people?" Within city cores, you will be subsidising high rises (in case any of my readers are liberals, that includes Trump Tower) at the expense of the various low rise support buildings around them. Once again, the rich get richer. Furthermore. this exacerbates the breakdown between the taxes imposed and the capacity to pay -- which was already a problem for property taxes. Since you are now squeezing the poorer income segments even harder, you will probably have to lower the aggregate tax take. I had interlocutors on Twitter object to this. Might not development plans change? Sure, if you have a magic want that can costlessly restribute land and buildings. Even if there eventually was a new equilibrium that was in some sense reasonable, there is no assurance that we can get here from there. There is no guarantee that the high density utopia that Land Value Tax devotees appear to favour would appear. More dense construction practices implies a greater need for local government services. (For example, a high rise with lots of apartments raises the number of tots that show up in the local school.) If the government does not get increased revenue as a result of the development, it is financially suicidal to approve the development plans. The next problem with a Land Value Tax is that it breaks the administrative process. We know exactly what people pay for properties -- but the values for land are not observed. Since mortgages are based on property value, there is a large private sector infrastructure for home valuation. This infrastructure keeps property assessments in line with the facts on the ground. Conversely, in urban areas, land values are purely hypothetical. Almost all transactions involve properties with buildings on them. In my district, my guesstimate is that there was exactly one land deal for sure over the past decade, and possibly a couple more where the houses involved burned down. An idealist might say that the government should pass a law against such abusive tactics. However, the law is what a judge says the law is. Most judges own houses. The government would have its posterior handed to it in court. The government is stuck with assessing taxes on a purely administrative basis, removed from market pricing discipline. (This will be just as efficient as the tax on windows.) In a big country like Canada, there are three options. It is a flat tax imposed on a per-square-meter basis across the country. However, if one glances at a map, one realises either that the tax rate would be laughably small, or it would wipe out the farming industry. It is administered solely at a local level. The problem is that if the local governments control it, the local governments involved would tell the LVT backers exactly where they could put their LVT, and it would not be implemented. The final option might attract some LVT fans, but it would be rejected by anyone with any knowledge of politics. The objection is straightforward. Imagine you are in the position of a Democrat living in a blue state. You should be very concerned about the possibility of handing the Republican-controlled Federal government the power to levy an arbitrary tax that can be targeted on the basis of ZIP codes. Unpopular minorities (like English-speaking Quebecers), tend to cluster geographically; giving central governments the power to target people on a geographic basis would raise civil disharmony. In order to avoid obliterating farmers (a political group that is almost as ornery as seniors), farm taxes per square foot have to be lower than urban land taxes. This creates a massive problem on the border of almost every urban area. If you start of at the centre of a town or city and walk in selected directions, you will eventually hit a border line between a suburban and rural land. The typical case is that on one side of a road is a farm, and on the other side there are houses. Under a property tax system, those houses pay way more tax per square foot. If a LVT were assessed on the value of land, it would be the same as the farm on the other side of the road. In order to avoid obliterating farmers, the administrative rule would have to impose higher rates on the households -- which they could avoid be being zoned as farms. Since practically all suburbanites have tomatoes in their backyards, we would suddenly have pressure to have most of the country declared as rural properties. The central government would suddenly be facing off in court against most of its voters in swing ridings. Good luck with that. If your model suggests that a Land Value Tax is more efficient than a property tax, your model is wrong. Thank you, Brian, for pointing out that the LVT emperor is not wearing any clothing. I've been saying this for years. I've also been saying that we in the U.S. already have an LVT embedded in our property tax, and that whatever economic miracle an LVT is supposed to produce has already been produced. The fact that we pay other taxes in addition to our LVT does not change that. All that said, there is an argument for property taxes, and an argument for "reforming" property taxes. Property is a form of wealth. In general, affluent people own (or rent) more property than poor people, and while most rich people invest in financial assets and businesses, some rich people do like to park money in real estate, so a PROGRESSIVE property tax would provide some socially useful redistribution. But in the U.S., property tax rates are at best flat, and in most cases regressive, so I end up paying a much higher rate than my millionaire and billionaire neighbors, mainly because they claim an agricultural exemption and I don't. I say get rid of most of the exemptions and replace them with a progressive rate. Yes, with a progressive rate, large farms and ranches would have to pay more than they do now, but if you own a large farm or a large ranch then you're a millionaire and you deserve to pay more. In practice, most large farms and ranches are increasingly set up as corporations or LLC's, anyway. So why do we have the current exemptions that make the U.S. property tax regressive in practice? Because the rates are set by state legislatures that are dominated by rich people. My state's senate has long been nicknamed "sirloin row" because it is dominated by wealthy ranchers. Yes, rich people are "ornery," as you put it, but that doesn't mean I should passively kowtow to them. I'm ornery, too. Thanks. I was going to bring up the issue of progressivity, but this article was already lengthy. The practical issue with a progressive property/land tax would be that rich people would legally subdivide properties. This might be difficult for suburban houses, but easily done for farms. You would need a massive change in legal practices (around here, at least), to allow the government to look through those legal shenanigans. The timing would also be an issue. Such a change could have been easily implemented in 1945. Right now, we have an ageing population whose whole retirement strategy was to buy as big a house as possible. You would be changing the rules of the game, when it is too late for them to do anything about it. I live in a jurisdiction with a 50% (roughly) marginal tax rate; that is a pretty good push towards levelling outcomes; this is not the case for other jurisdictions. That's like arguing because you eat an apple every week in between pizza's, a bad diet can't be the reason you are fat. Is there a longer history for that property tax graph anywhere? 1) Good point about the property tax graph. I cut it off in 1990 out of force of habit. The series goes back to 1961, and it started off at a higher level (13%). It dropped in a straight line in the 1960s, and remained around current levels since then. This is not too shocking; the biggest expense in the welfare state is medical care, and costs were lower back in the 1960s. (Less medical procedures available, younger population.) Meanwhile, there was a construction boom in response to post-war economic growth, and so municipal infrastructure investment would likely have been much larger. Most areas of the country are much more stable infrastructure-wise. (2) I don't see the mystical distinction between land and buildings. Canadian wood frame housing is not built to last forever, but even so, most of them built after World War II are still around. So why draw an artificial, unmanageable distinction between "land" and "property"? Feel free to tax *property* more, but you will get spit on by old people when election time comes around. As discussed in another comment here, property taxes are not progressive, while income taxes are. On paper, one could imagine progressive property taxes. In practice, you are fighting against the legal system -- the rich would sub-divide properties to drop the tax rate. You would need to overhaul the entire legal system to try to stop this, and the courts may not cooperate with your quest. Since we are taxing the income flow the property generates, why do we care about the stock level of market value? Meanwhile. you are creating side effects that I did not discuss. For example, increasing the taxes on land/property tilts the balance away from railroads to trucking. Trucking companies get a free ride on the road infrastructure (which they disproportionately destroy), and are less energy efficient. You'll have to intervene with subsidies to make railways viable again. "More dense construction practices implies a greater need for local government services"
And human behaviour. They don't generally want to live in high rise flats. That's a middle class liberal solution to avoid the alternative - knocking down their mansions and building modern terraced housing. Most everybody, given a choice, wants their own door onto the street. For people without kids, high rises are fine. People with kids generally want to get out of them. The usual signal to buy a house was when a kid was on the way. In any event, arguing that we should rebuild Canada’s entire housing infrastructure just because some 19th century crackpot had a bug up his posterior about “land” instead of “property” is just plain bonkers. Something about economics training seems to require losing any vestiges of common sense when trying to apply economic models to the real world. As I noted, I have not looked in detail at the LVT proposals. But looking at that summary, I’d argue that almost all of the points are dubious. You cannot rely on what some guy said in the 19th century, and assume it remains valid. In an agrarian society, it may have made sense to equate land ownership with “wealth”. Now, not so much. How much land does an investment bank need to rip off its customers? In Canada, 71% of seniors own their houses - and it’s not a safe assumption that the other 29% are the bottom of the income distribution. A VAT and income tax, as well as electronic records, makes avoidance of taxes extremely difficult. I live in a high tax jurisdiction; you could see obvious compliance issues as late as the 1990s. Now? The only people who can avoid taxes completely are criminals using cash. Sure, plumbers and so forth do side deals using cash. However, they know that they can only avoid so much tax, as otherwise the gap between their spending and income would be easily demonstrated in court. The only gaping hole in modern tax systems is the use of international transactions. However, how exactly is a land value tax going to impact some guy with $100 million in securities sitting in a tax haven? Rich people will be fighting the assessments in court all day. They are the only ones with the resources to do so. Since there almost no transactions to base land value off of, the government will just lose. This will make the assessment system a complete joke, and widely viewed as unfair. Meanwhile, if you change to an aggressive tax on land, it will only be non-abandoned land that will be used. Weak-handed land owners will be forced to liquidate - like most of the lower middle class. Most countries subsidise farming - not exactly a sign of massive income generation. As land is defined as everything not supplied by human effort, a tax upon it cannot elicit a supply response. As such, it cannot distort resource allocation or be passed on in higher rents. Due to the fact rents are set by the levels of incomes/capital at the marginal of production, the consumption of land will always be highest among the wealthiest. That is, they own a disproportionately high amount of valuable land. Which is why a tax on land reduces levels of inequality in society. It must transfer incomes back to the margin of production else the value of land wouldn't fall to zero. For those that understand the mechanics of tax incidence, valuations are as much of an issue as we want them to be. Any large land/property owner sets their rents using a range of metrics, including vacancy rates. Yes there are transitional issues, like poor widows in mansions. But they are separate issues as to whether a LVT is a good idea and should therefore be enacted for those who would benefit in perpetuity. As a transitional issue, poor widows can be offered roll up and deferment. So by the measure of increasing prosperity, while producing an equitable distribution of incomes/wealth, the LVT is the optimal policy tool to do so.